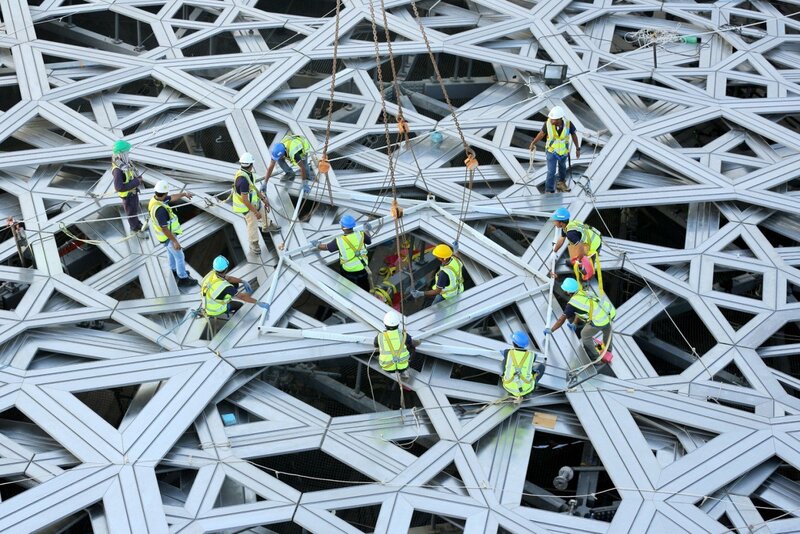 French architects Ateliers Jean Nouvel designed the complex shell of Louvre Abu Dhabi, a project under development for over a decade before finally opening to the public earlier this month. A new timelapse video from EarthCam captures the eight-year-long construction process from groundbreaking to completion, from the enormous earth moving enabling works to the final mid-air roof assembly before it was gently lowered into place. The Louvre Abu Dhabi is an art and civilization museum, located in Abu Dhabi, United Arab Emirates. It is the cornerstone of a new $27 Billion USD touristic and cultural district arising on Saadiyat Island, and part of a 30-year agreement between the city of Abu Dhabi and the French government. Saadiyat Island is planned to include three other museums, including a Guggenheim Museum and the Zayed National Museum. Featuring approximately 260,000 sq ft of enclosed area, with 86,000 sq ft of galleries, it is the largest art museum in the Arabian peninsula. The final cost of the construction is expected to be about $715 million USD, not counting fees paid by Abu Dhabi to be associated with the Louvre name, and additional fees to be paid in exchange for art loans, special exhibitions and management advice. Unlike much of UAE architecture, this spectacularly aesthetic roof dome, which appears to float above a collection of functional buildings below, is actually a complex machine that actively controls the interior environment – protecting users and valuable artworks alike from the punishing climate.